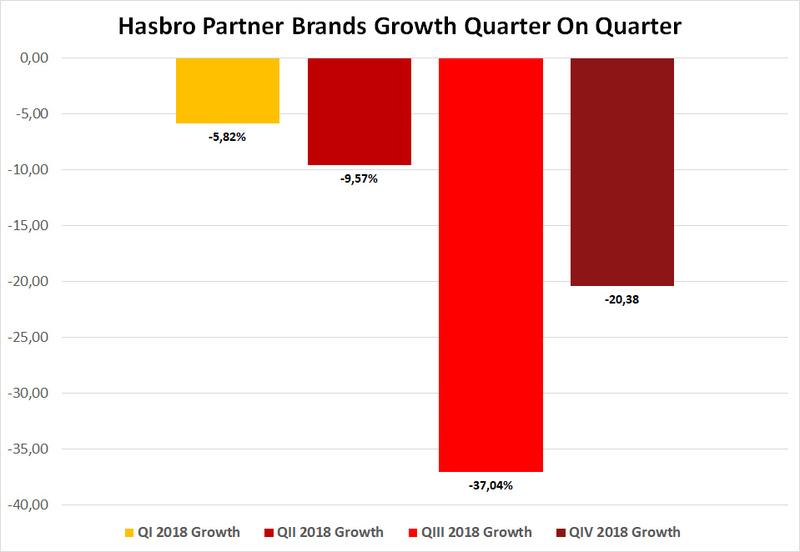 Earlier today Hasbro released their numbers for Q4/2018 and the full year 2018. The results are not great. Hasbro faced some serious headwind in the past year. Click through for all the relevant numbers and results! 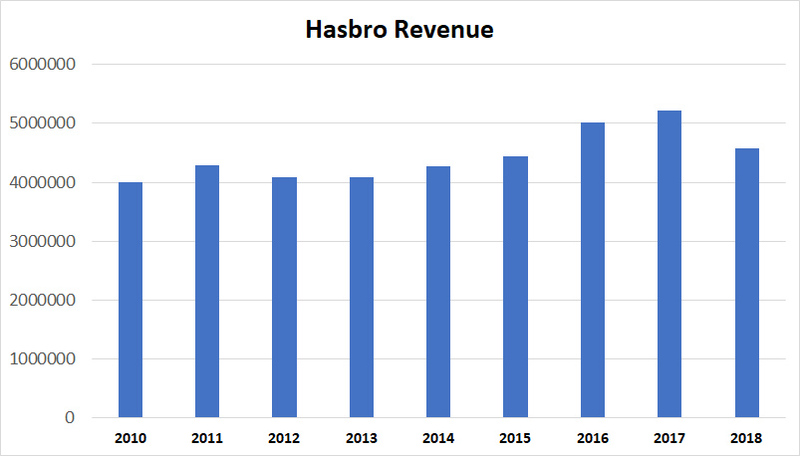 For the full year 2018 Hasbro’s net revenues are down 12%, total revenue was $4.58 billion. 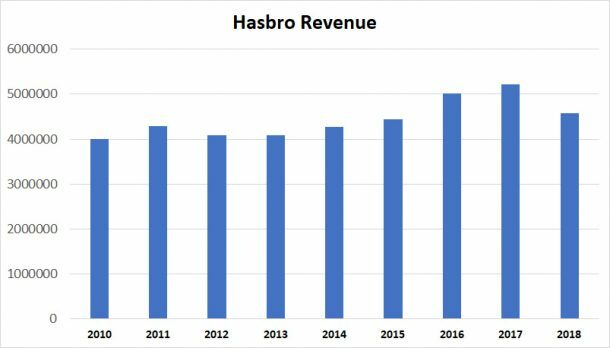 A significant decline from 2017 when Hasbro made $5.21 billion. The US toy market only declined by 2% in 2018, as it seems Hasbro was more affected by the demise of Toys R Us than some other (smaller) toy companies. Hasbro gives several reasons for the performance in 2018: the loss of Toys R Us, a more meaningful than expected liquidation of TRU inventory and for Europe Hasbro also cites “changing consumer shopping behaviors”. Another key reason provided by Hasbro is reduced retail inventory in both North America and Europe. This is a very nice way of saying retailers stocked less Hasbro products in favor of other companies. We do know from other sources that retailers reduced shelf space for Hasbro action figures, for example. Hasbro’s results are no surprise, the first three quarters of 2018 were quite lackluster, and with Disney releasing their numbers a few days ago it was clear that one of Hasbro’s most important brands, Star Wars, had a very difficult year. But let’s look at some numbers! Overall revenue, while worse than in the previous two years, is still higher than in 2015. Hasbro’s net earnings are significantly lower than before, it’s a new record low for the decade. Actually, I had to go back all the way back to 2006 to find a year with similar net earnings. 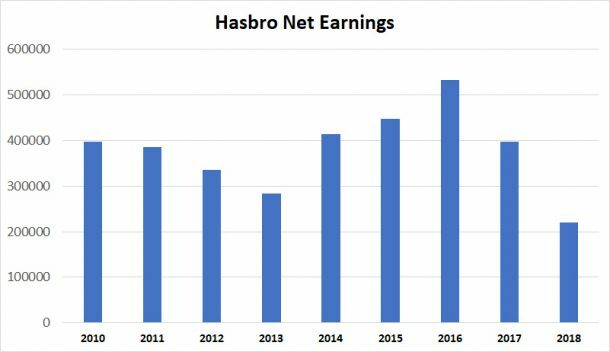 Of course, it has to be pointed out that Hasbro is still making money, it’s not as if they actually lose money, they just make much less than before. As you can see each quarter in 2018 performed worse than in 2017. Partner Brands include Star Wars, Marvel, Beyblade, Frozen, Disney Princess, Trolls etc. The holiday season (beginning in October) saw somewhat slower decline than the third quarter, which most likely illustrates the importance of previous Force Friday events in the third quarter, when all new Star Wars toys are released for the upcoming December movie. With no Force Friday Star Wars most certainly had a huge impact on Q3 results. Now, Hasbro didn’t give any numbers for Star Wars or any other partner brand. They merely repeated what they said throughout the year: Marvel and Beyblade showed growth which was more than offset by Star Wars, Frozen, Disney Princess and Trolls. Please consider that Frozen hasn’t had a new movie in years and there has been no new Disney Princess for quite a while either, however, we can conjecture that Star Wars had the biggest impact here. Solo was a box office flop earlier in the year and with no Force Friday and new Star Wars movie in December Q3 and Q4 results were definitely heavily impacted. In 2018 Partner Brands revenue declined by 22%. Despite growth by Marvel and Beyblade and an overall segment growth for action figures and dolls in the USA, which is still the most important market for Hasbro. 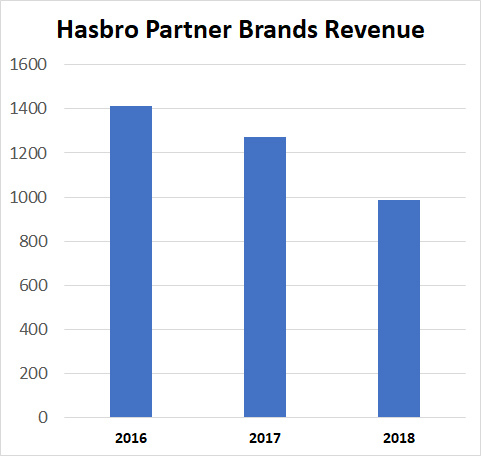 Overall, Hasbro showed optimism, in 2019 their brand new Power Rangers line will finally launch (Bandai had a sell-off period for their products) and on top of several huge Marvel movies and Frozen 2, Episode IX in December will most likely result in higher Partner Brands revenue again. But still, the 2018 numbers are disappointing. 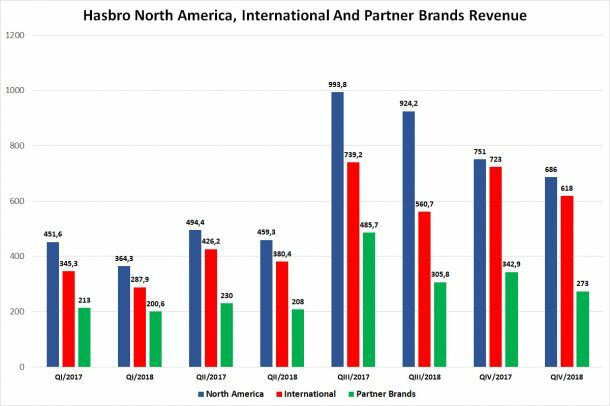 It seems that Hasbro has been hit much more by the demise of TRU and a changing retail landscape than some of their competitors. The overall toy market in the USA only shrank by 2%, in the UK it was 7%, in Europe (EU) it was 3%, Hasbro’s revenue declined by 12%. And while action figures in the USA showed 10% growth Hasbro couldn’t really profit from that. Their Marvel line did really well, but that was more than offset by Star Wars. The doll segment also grew in the US, but Hasbro’s Frozen and Disney Princess lines still shrank. But with no new entertainment to support these lines it’s difficult to compete. And the top 10 traditional toys in the USA are dominated by MGA and their L.O.L. Surprise line, Hasbro has nothing successful on offer here. It also has to be noted that brands such as MGA and various other smaller companies dominate online, Hasbro relied much more on traditional brick and mortar retailers than some of their competitors, so the TRU bankruptcy hit them quite hard. Hasbro has some work to do, but I agree with Hasbro’s own forecast that 2019 will most certainly be a better year again. And once again: Hasbro themselves are in no danger at all. They make money, only less than before. Next Article: New Wave Of Galaxy Of Adventures Figures Revealed!